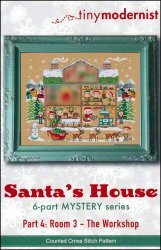 Santa's House Part 4: Room 3 - The Workshop [G8715] - $2.00 : Yarn Tree, Your wholesale source for cross stitch supplies. Cross stitch pattern from Tiny Modernist. Hurry, hurry, Christmas is almost here! The elves are busy making Christmas toys for all of the boys & girls. Baby dolls, trains, teddy bears & oh so much more! The warm cookies have been pulled out of the oven. The dining room table is set for dinner. Outside the snow is falling & Santa's reindeer are eating their dinner. What is behind room #4?!?! Stitch count is 140h x 179w.